The surgical procedure to place an implant is very easy. Most patients say it is easier than having a tooth extracted. The implant site is prepared by making a small gum incision followed with small drills of increasing diameters. 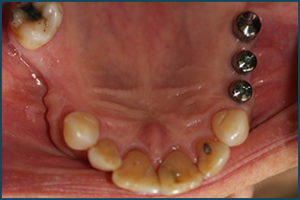 The implant is screwed into the jawbone in an exact position to accommodate the future crown. The gum tissue is closed over the implant site to allow the bone to integrate and bond to the surrounding bone. 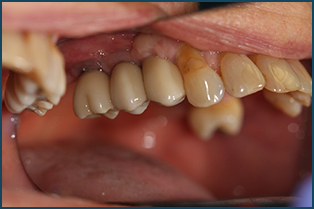 For missing front teeth, the patient is able to wear a partial denture (flipper). 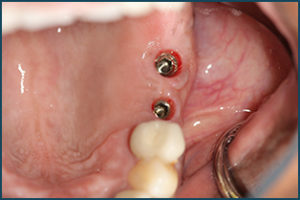 After 3-5 months, the implant site is opened to place a healing abutment. The gum tissue is sutured around the healing abutment to prepare for the future crown. After the gum tissue heals (1-3 weeks), the general dentist will take an impression of the implant to fabricate the permanent crown that is either cemented or screwed onto the implant. 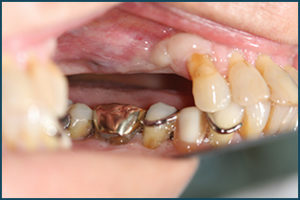 In some cases, the dental implant can be placed immediately after the tooth is extracted. This procedure depends on the amount of bone, the absence of an infection and the location of the maxillary sinus and major nerve in the lower jaw (mandible).